GREENVILLE, SC -- (MARKET WIRE) -- May 14, 2007 -- Join Dr. Tom Baumgarten of Piedmont Orthopaedic Associates, a board-certified orthopaedist specializing in Sports Medicine, as he performs this outpatient procedure at Bon Secours St. Francis Health System in Greenville, SC live on www.OR-live.com. 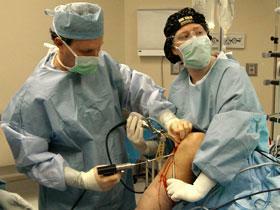 Anterior cruciate ligament tear (ACL) is one of the most common injuries to the knee. Reconstruction of the ACL can help most patients recover full function and resume an active lifestyle. The goal of ACL reconstruction surgery is to prevent instability and restore the function of the torn ligament, and create a stable knee.